The real estate market in Highlands and Cashiers has been down for some time. Although there has been no phenomenal growth, there has been a steady growth, which economists seem to agree is the best growth market. While Real Estate Brokers may enjoy a fast pace growth, steady is good also. Although this is our slowest time of year, there are positive signs. This winter has seen good, overall results. Highlands and Cashiers Real Estate see the majority of sales increasing in May and then falling around November/December. However, this data is based upon “Closed” sales, which typically run about 2 months behind start of contracts. 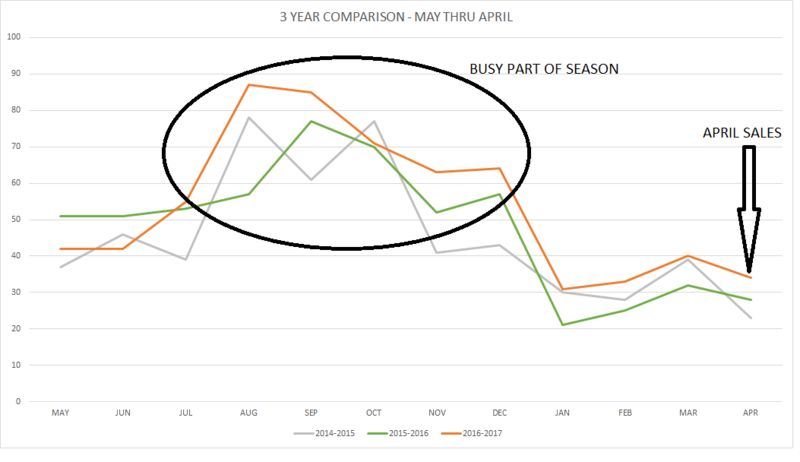 Still when we look at April’s data compared to the previous two years, we see an overall market gain. These are positive signs in the real estate market for this area. Total homes listed in Highlands/Cashiers MLS: 1081 – As the season heats up, so do the number of homes coming back onto the market. Many took their homes off market for the winter months. This is a strategy used by some Brokers. However, it may not be the best strategy. Homes Sold This Month: 34 – April is typically the slowest month. However, remembering that the market data shows about a 2 month lag, this means that contacts began around February. YOY Inventory: 20 months – A very high inventory. Prices continue to be held low. Average DOM: 489 – This is not a typical market. Home buyers often feel a high DOM is reflective of some other issue in a home. High DOM in this market basically reflects a very short selling season and that homes carry over from one season to the next. To really understand DOM and other factors in this market, one should really contact a local broker that is from the area and truly understands this market. Median Sales Price: $245,750 This is increasing back towards the $300,000 mark which held for so long in 2016. Average List/Sell Ratio: 92.6% – A slight increase, showing that Buyers are paying a little closer to list price. Synopsis: As the market tends to show some increase and Buyers are paying closer to list price, it would seem to indicate a climate change moving toward the Sellers. Although this is still considered a Buyers Market, Buyers may not want to hold out too long. Prices in this area are the best they have been in many years. One may want to take advantage of this pricing as market trends start to show favor to the Sellers. However, Sellers should not get too excited. Over confidence will just lead to overpricing. Land Units Sold: 10. This is actually lower than the previous 3 years. Total listed in all MLS: 1058 – This is a slight increase. However, more land listings with less land selling will continue to hold prices down. Inventory: 8+ years. This is an extremely high inventory. Synopsis: While construction is being seen in the area, much of this appears to be on land that has been vacant for many years. There has been some speculation as home sales show increase. Some have been building homes to get their land sold, as there is very little to no demand for land. 35% of home sales ranged from $200,000 to $499,999. 3% of home sales ranged from $750,000 – $1,000,000. 12% of sales were above $1,000,000. BUYERS: This could be the season when we see the change from a Buyers Market to a Sellers Market. This has already been the case in surrounding areas. Making a move now may be your best opportunity in this market. SELLERS: Positive changes could mean an opportunity to get your home sold this season. Still, the List/Sell Ration indicates that pricing may be a little high. The strategy used by some is price high and sell lower. Unfortunately, this can mean Buyers will just pass on your home to find one more appropriately priced. If you’re motivated to sell your home, let that be reflected in your pricing. Remember, it’s more attractive to get multiple offers than to get none.